UK Treasury Propaganda Warns of 3.6% Brexit Recession, the £64 Billion Question? The Treasury (UK government) is to issue a statement today that basically puts the price of Brexit at 3.6% of GDP or £64 billion, resulting in a 1 year recession (much milder than the last), which is set against a large chunk of the euro-zone having been in economic depression for 6 long years. Leaving the European Union would tip the UK into a year-long recession and lower Britain's economic growth by 3.6%. Though the margin of error is probably at least 3% that effectively could completely cancel out the Treasury forecast. The £64 billion Question ? 1. £500 billion was pumped into the Banks through a myriad of scams, I mean schemes and on top of which we had tax payers taking on the banking sectors liabilities which amounted to about £4.2 TRILLON! 2. The government since 2010 has BORROWED over £750 billion! UK National debt has risen from £950 billion to £1.7 trillion today, which averages £115 billion per year. So in terms of borrowing, financial crisis and consequences, in the grand scheme of things £64 billion is not of any real economic significance for all the Government needs to do is for George Osborne to call up the Governor of the Bank of England and instruct him to PRINT £64 billion, to transfer over to the UK Treasury, recession averted. Think again, it is already happening RIGHT NOW! Using what I termed several years ago as the Quantum of Quantitative Easing (July 2012 The Quantum of Quantitative Easing Inflation is Coming!) that explained in detail where this game of money and debt printing is going in terms of the REAL debt burden, which basically means that the real UK debt burden is about 30% lower than the actual reported debt to GDP ratio suggests because of the fact that the government is paying interest to itself via the Bank of England which in effect acts to cancel 30% of the public debt, which is why the Debt to GDP ratios that academic economists tend to obsess over are meaningless as a consequence of the Quantum of Quantitative Easing, which is why they cannot see the inflationary consequences of what is going on in the asset markets. Know this that the Quantum of Quantitative Easing is PERMANENT, so whilst the monetized debt may still officially exist, it HAS in effect been cancelled because it will NEVER be repaid but instead rolled over in perpetuity as Inflation does its job of eroding away ALL of its value. So the government is already getting FREE money from the Bank of England EVERY YEAR to tune of about £20 billion per annum. So what difference would a one off print run of £64 billion make? NONE!. In fact this probably IS the policy that will be implemented post Brexit so as to AVOID the forecast 3.6% drop in GDP! 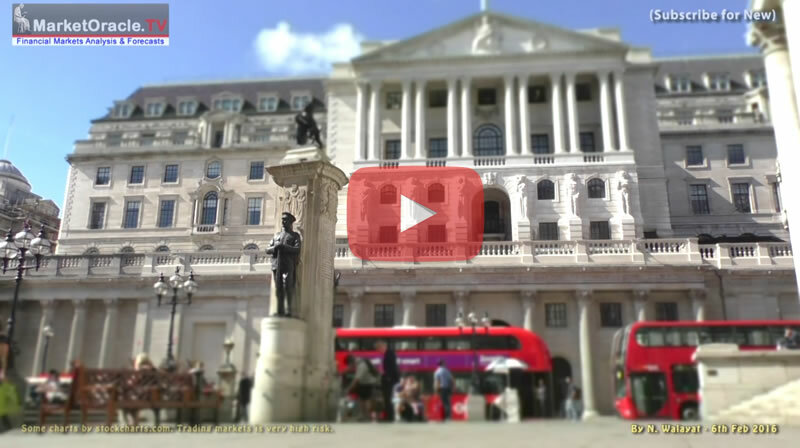 The Bank of England has already done the same every year since 2008! That in totality (QE, funding for lending scheme) totals MORE than £500 billion! Or near TEN TIMES the UK Treasury's estimated cost of a Brexit. The government repeatedly puts up a smoke screen (lies) of how much it intends to borrow for instance the new Conservative governments debt fantasy of a year ago was for a surplus by 2018 of £5.2bn and total borrowing of £115 billion. A year on the OBR in March 2015 increased the forecast amount the government was expected to borrow by +£62bn, from £115 billion to £178 billion. However this is still £135 billion LESS than my forecast of £315 billion as the following updated graph illustrates, which now also includes an additional year forecast by the OBR for 2021 which is equally unrealistic at -£11bn in a perpetual game of smoke and mirrors played on the general public. So with a hole of £135 billion yet to be filled towards a borrowing total of £315 billion then expect the governments' department for economic propaganda to keep revising the amount the government is expected to borrow higher every year by at least another £135 billion this parliament. Whilst at the same time conjuring deep deficit reductions and even surplus forecasts for far distant years that will never materialise just as has been case for every UK government of this century! This illustrates the debt and deficit game that the Government tends to perpetually play in which respects the supposed £64 billion BrExit cost would go the same way, swallowed up by statistics and slights of hand. The bottom line is that the Bank of England would PRINT 3.6% of GDP (£64 billion) to monetize government debt to cover the UK Treasury's forecast of the consequences of a Brexit. Though of course the UK Treasury is painting the worst case scenario, so the amount requested to be printed could be as little as £18 billion or 1% of GDP. Either way it will be of little economic consequences as recession will have once more been averted just as has been the case for every year since 2010. And then we have yet to factor in the benefits of having a whole layer of bureaucracy removed that is holding the UK economy back. So instead of taking a 3.6% hit the UK economy could get a 3.6% BOOST! Never mind all of the civil and social benefits of CONTROLLING IMMIGRATION! i.e. school places, NHS, housing, jobs and wages. 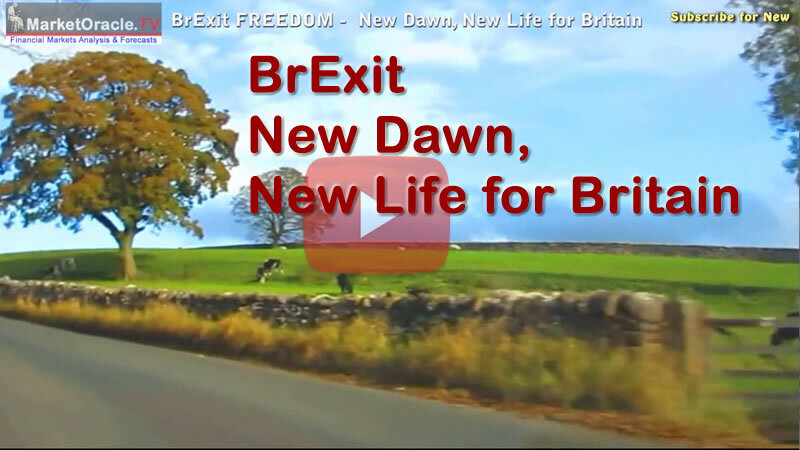 EU Referendum - Counting Down to BrExit! With just a month to go the Market Oracle's own 9 month long BrExit campaign has been ramped up a few notches as we enter this last stretch, producing Brexit resources from in-depth analysis, rebuttal articles such as this, many videos, and also active on the social networks so as to do our best to do our part in Britain not wasting it's very last chance for freedom which you too can support allowing us to continue to intensify our efforts to counter the daily barrage of REMAIN propaganda as well as to keep producing video's that help spread the case for BrExit being good for Britain.